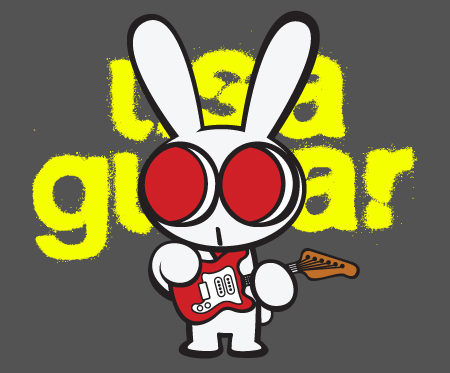 USAGUITAR is a cute little bunny rabbit who’s got a guitar ( a red stratcaster ) and a little red scarf, which are his trademark items that he’s always with. Normally he’s really sweet looking, taim and quiet until he starts playing his punk rock guitar, when he explodes with a true spirit of punk rock !!! USAGUITAR absolutely loves playing his guitar, and his guitar sound just makes everyone sooooooo happy! Adores organic carrots, by the way. USAGI = rabbit in Japanese. 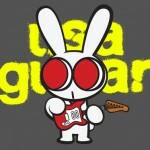 USAGI + GUITAR makes USAGUITAR! The entire story begins with a little jokes from a guitarist and an illustrator having a few drinks in a pub. 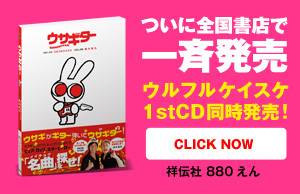 Though he’s only a newborn baby character, he and his cute punk rock world garners a lot of admirers from all of Japan. The story began from just one little drawing / doodle, even and one rough guitar tune. USAGUITAR is only a newborn baby character though we all believes that he has a huge power and potential to ‘transmit’ every music lover / or even music hater ( …well, if there is any ) spirit of ‘ Smile & Destroy ‘ by appearing in various merchandise, collaborations, and internet buzz marketing etc! WE NEED YOU! to join our GIG to make it a cool, punk rock hype right now! Let’s join our gang of music animals by filling in the form below to get your own unique character created by the artist himself! The gig starts from X’mas eve 2009! Limited to 100 people! 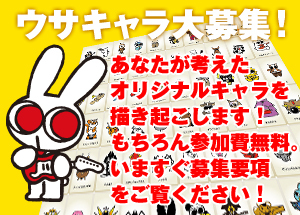 USAGUITAR creator & illustrator Hanamaru will create an original USAGUITAR character just for you! Is it actually true that he actually hand draw them all one by one? THE ANSWER IS …… OH, YES! But, wait! Is he really, really capable of doing so from the first place? THE ANSWER IS ……. MAYBE! It is truly a crazy triathlon mission that the world of illustration has never seen before! [ animal ] + [ music ( instrument / genre ) ] makes the name of your music animal. The last of the [ animal ] part and the first of the [ music ] part need to share the same letter or sound to start with! Please check if your choice of music animal already exist. You may find it handy referring to index page of our music animals a.k.a USAGUITAR family. Only one character per person ! Love USAGUITAR from all of your heart! Join twitter as character avatar and follow USAGUITAR family and tweet to each other. Make the hype! May also use as Facebook icon! Absolutely NO idea what you should become? [ instrument] can be replaced by [ genre ] or even [ music related word ]. [ Panda ] + [ dive ] makes [ Pandive ] for instance. Please fill in the gap below, copy and paste to e-mail admin. I apply an original music animal project. The name of the animal is ____________. The name of the music is _____________. Characteristic ________________________, and usually _________________. Interested in _______________________, but sometimes ______________. Not many people know but my weak point is _______________. My friends point out that I’m ___________________, ＿＿＿＿＿＿＿＿＿, and ___________________. We will contact you within 2 weeks of application. We may contact you if there’s any inquiries. Join USAGUITAR Family ! and have fun!! USAGUITAR Web comics ! coming up soon! USAGUITAR appears in a short comic strip updating every weekday! Available on PC, mobile, and i- Phone format. The story is originally written in Japanese though the English subtitle will be attached. Spring 2008, the two artists having a few pints in a pub. Keisuke: Alright, mate? Haven’t seen ya for long, how’s it goin’? Hanamaru: Well, the usual. I’ve got a few pieces of drawing with me at the mo. Wanna have a look? Hanamaru handed over a little word book. Hanamaru: Been drawing in those. He was always with a little word book to draw little doodles and ideas on as word book artist. Keisuke started laughing on one particular drawing. Keisuke: Hahaha! What a hell? USAGI + guitar makes USAGUITAR? Silly! but cute, innit? Hanamaru: You like him? What kind of guitar sound he’s gonna come up with, do you reckon? Keisuke: Well. I guess it’d sound really punk just like when you and me had gigs together back in the 90s, don’t you think? The two had been a neighbors for a long time back then, they did a few gigs covering tunes from The Clash, The Roosters (*1) etc. They are sharing the same air and the mood of the music scene of the generation. ‘ Clash! Toy Dolls! Dolls! Stoogies! RC (*2)! Roosters! Damnd! Adicts! Rncid! ‘ ….the drinking session goes on …..
A few days later, Hanamaru received a CD-R with Keisuke’s hand writing says ‘ The theme of USAGUITAR’ . The sound is just so energetic, catchy, and POP! YES! One little harmless doodle create a greatest Punk rock tune! The historic moment when USAGUITAR has been born!! Guitarist. The one and only leader for Japanese rock band ‘ Ulfuls’ . From Takatsuki- city, Osaka. Blood type A.
Nicknames are ; mister smile, the laughing guitarist, NANIWAN-guitar, etc. After they decided to suspend their band activity for a while, Keisuke is willingly joining various project. Biggest supporter for the baseball team, Hanshin-Tigers. Illustrator. Director for a creative studio U-MA. Created character illustrations for ‘ Yamaarashi’, ‘ Gospellers ’, ‘YumYum Orange’ , ‘ Snail Rump ‘ etc. Also done a lot of Art direction for various musicians. a.k.a.the basist from a legendary punk band ‘ Ebi’.